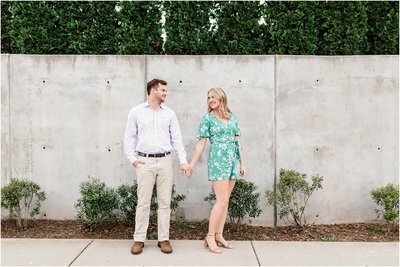 Y’all, I’m so excited about this sweet couple will be my first wedding of 2018! They’re getting married at Arrington Vineyards in February. I never want snow, but I want snow on their wedding day! I’m getting ahead of myself, let’s talk about their summer Nashville session. When I met with Nicole and Rand to talk about their engagement session, they wanted to shoot with the Nashville skyline in the background. Rand is one of the rare ones who was actually born and raised in Nashville and Nicole is a fairly new transplant, so the city has meaning to both of them. It was also super important to have some photos (especially a ‘save the date’ photo) with their sweet pup Nora. Being a dog mom myself, I was more than happy to include their fur baby in the shoot. After we in front of the skyline and pedestrian bridge, we drove down West End to Montgomery Bell Academy. Rand graduated from there, so the location had special meaning to him. It is such a beautiful campus! It was such an honor to be able to shoot there. We used up all of the available light until we had to stop because it was too dark. These two make me look forward to their winter wedding next year.